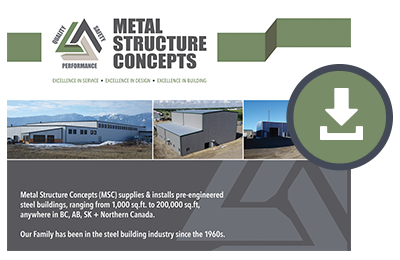 Metal Structure Concepts (MSC) specializes in all forms of steel construction, including: pre engineered steel and structural steel, ranging from 1,000-200,000 sq.ft, anywhere in BC, AB, SK + Northern Canada. Our Family has been in the steel building industry since the 1960s. greater design flexibility, faster occupancy, and lower maintenance costs. to meet your logistical and budgetary needs. to our clients all across Western Canada. Our designers, managers and ground crews work in unison through each step of the process, seamlessly turning your chosen design into reality. At MSC, we offer an industry-leading three-year custom in-house warranty. Contact us for more details. We deliver projects using in-house crews that exemplify teamwork and safety, with a track record of safely installing buildings all over Western Canada. A large percentage of our buildings come from word of mouth advertising. A happy client is our best advertising. We partner with a trio of reputable North American manufacturers. 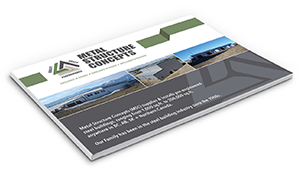 Pre-engineered steel buildings have lower initial costs, greater design flexibility, faster occupancy, and lower maintenance costs. 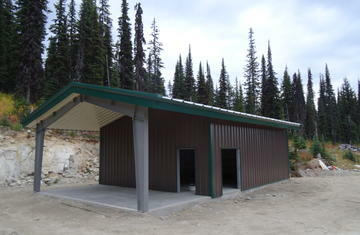 This was the first project we hired MSC for, we have since completed three projects with them! One project was the erecting of a building that another contractor had failed to complete. Not only did MSC save the day, they put up the building with little to no issues. We greatly appreciate their hard work and we look forward to hiring them again. 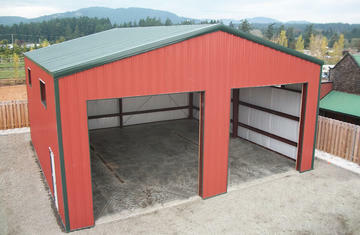 MSC is an important building partner with StorageBear as we launch our newest self-storage facility in West Kelowna. From the first day of our site planning process, we relied on MSC's expertise and guidance to help us design a building that fit our budget and project plan. They worked around our schedule and hit all project deadlines along the way. The installation crew was easy to work with and their quality of workmanship was top tier. The management team was competent and professional, even when we threw a few change order curve balls at them! StorageBear will continue using MSC for future buildings as we phase our facility over the next couple years. I purchased a building from MSC in 2013. We choose MSC after checking references, touring MSC buildings and personally interviewing Steve Ivanitz. MSC’s crews arrived on schedule and did an outstanding job. Their foreman was knowledgeable and always ready to answer questions. The job was finished on time, on budget and the entire job site was left clean and ready for the next stage of our project. Safety was always the highest priority on site. Throughout the entire project, Steve was outstanding to work with. His extensive knowledge of pre-engineered buildings combined with his strong interpersonal relationship skills guided us through our project from start to finish with very few issues. Throughout the project, Steve was always a phone call or email away and always had our projects best interest in mind especially when it came to the project budget. It is hard to find a contractor you can trust with your wallet. A huge thank you to Steve and his team for a job extremely well done! 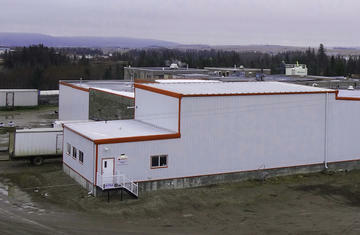 In 2011 NCC Development Limited issued an RFP for the design build of a 5 bay, 6000 sq' storage facility in Iqaluit NU. The RFP was for a supply and installation. Olympia Steel was the chosen supplier and they highly recommended Steve and his MSC crew. Within a week the deal was done for the erection contract. 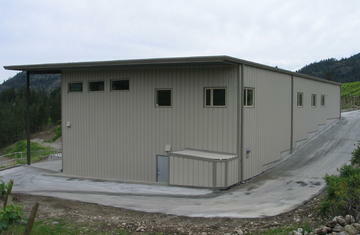 The building went very well and I was impressed with the production and quality of their work. MSC and their crew also stepped up to the plate to help with a few lingering issues we had, it was our first building like this and there were a few growing pains to be sorted out. MSC made the changes in a timely manner and at no cost to us. I appreciated how they honoured their work in such a remote location that is 3 time zones away from their home base. The relationship was then established and we utilized their services for two more warehouses at 9000 sq' each and also utilized their services for the completion of a special project in Iqaluit, a media studio. MSC is and will be our one and only erection team for steel in the north. When our next project comes up we will also look at a supply and install. The level of professionalism and care showed by the team makes the decision easy for me to choose to work with them again and to utilize more services that they offer. MSC was hired to build an addition to our precast concrete plant, for the purpose of manufacturing concrete pipe and other precast concrete products. MSC was chosen because they showed us early that they would work with us when changes to the design were made. Overall experience with staff was excellent, someone was always available to answer questions when called upon. Erection of the building was timely and professional. Overall experience was good and we would definitely recommend MSC for future projects.